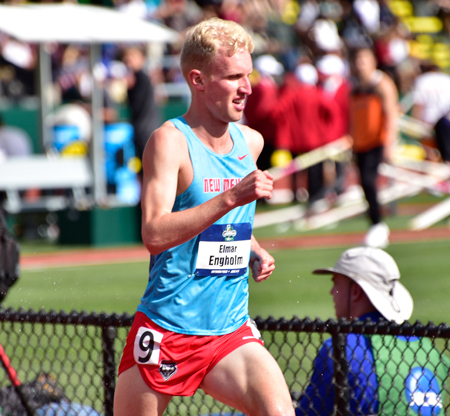 Completing a collegiate career at the University of New Mexico, Swedish middle distance runner Elmar Engholm returned home to Scandinavia this summer and resumed training 3-4 hours a day in order to begin running as a professional. Specializing in the 800 meters, 1500 meters, and steeplechase—events Engholm has raced for his home country at the European Championships and UNM at the NCAA Championships—the 24-year-old’s next challenge is preparing for the 2017 World University Games in Tapei (August 19-30). After being trained by Joe Franklin while a student-athlete at UNM, Engholm currently collaborates with his father (who also ran the 1500 meters for the Swedish National Team) in planning and managing his training. To further support his goal of advancing to an elite level in Europe and qualify for World Championship events, this past spring Engholm began assessing his daily Readiness with Omegawave Personal. Omegawave: What was it that first resonated with you about Omegawave and what our measurements could potentially add to your training process? Elmar Engholm: It’s really all about being able to measure the things I can’t get from my body just by feeling. There’s some precursors to overtraining that are obviously hard to recognize simply by waking up in the morning and thinking about how you’re feeling, and Omegawave’s measures are a very good tool to evaluate how the body really is feeling and how you’re recovering. It’s a learning process, but I think it’s been very interesting to track these things over time and hopefully I’ll be able to look back at the end of the season and see I was feeling good there versus I wasn’t feeling good there. Engholm (#250) leading the pack in the steeplechase. OW: You were saying that you’re not always able to accurately know your Readiness or what your level of fatigue is just based on subjective feelings… in the past, has this lack of objective information resulted in training issues or downturns in performance? EE: One thing I’ve really struggled with is peaking at the right time. I’ve run really well when I’m coming off hard training, but then when I’m supposed to run well later in the season at a championship or major event, I have fallen way short of how I should be able to perform… even on half the training I was doing. So—recognizing that—I was probably working too hard in the middle of the season, thinking I was in really good shape at the beginning of the season… so now I just need to add more and more work and then I’ll be even better at the end of the season. OW: What types of interventions or programming changes have your coaches made based on some of the competitions where you were hoping for better results? Have they tried blood, saliva, or other laboratory tests, or looked at specific changes to this or that training block? EE: My first autumn at the University of New Mexico, I found myself running really well—and there in Albuquerque, it’s up at 1600 meters of altitude. Then I actually got injured and I struggled. I was working really, really hard and I was feeling fatigued, so we got a blood test and I was low on iron. Later in my career we always came back to that, thinking maybe my iron wasn’t high enough. We also had doctors available as a resource, and once in a while I would go in and I would have a high heart rate. They sort of figured that I was “overtrained,” and we did talk about it, but a lot of times it was more of the approach like let’s try [normal training] again next week, or next month, and see what happens. OW: In addition to those screenings that you mentioned, the blood tests and medical visits, was there any kind of regular and consistent monitoring taking place during those years of running? EE: I wouldn’t say it was regular—however, once we discovered that I was low in iron, we did make regular appointments to get that checked out. At that time, it was really more my coach who wanted me to have the blood tests, because he could tell even before I could that I was run down and not running or training well. Which is sort of interesting, because I would wake up some days maybe feeling a little tired, but I would always go to practice and push hard because that is what I had always done… maybe not realizing that at the high volumes I train, you keep digging yourself in a hole if you do that. OW: Since you began using Omegawave, what have been the major takeaways thus far? EE: For me, it’s really interesting being able to actually tell the things that I can’t feel. DC Potential is something I find really useful, and I can track that on a day-to-day basis because it can change a fair amount in a short period of time. I can actually tell if I’ve had a really hard session the day before, or if I’ve slept poorly. Recovery pattern is also something I consider important. Even after I’ve had a really hard session, I might still be at a nine or ten in cardiac readiness, and my adaptation reserves might still be quite high, but I can tell from the recovery pattern as well as the CNS readiness that I’ve been working hard and my body is trying to recover. OW: How has this information changed the method or the concept of how you’re going to train yourself in the future? EE: It’s opened-up to me that training can’t always be on this set schedule—where you have to do this on this date, and you have to do this the next day, and you have exactly what you’re supposed to do three weeks in the future. I think Omegawave is really helping me understand I can’t structure my training like that because my body is going through the training, and it’s maybe not going to respond to this or that, or maybe I’m going to feel run down the next week. I’m quite excited actually being able to sort of play with my training more and being able to really customize it more after myself.